Tim and Janelle really go above and beyond to make the day absolutely perfect! We couldn’t Have picked a more beautiful place to get married! The property is very well maintained and you can tell the owners take great pride in what they do. Absolutely perfect and by far the best day ever!! We are so glad you picked us to be a part of your amazing day! We wish you many years of happiness! The owners of this venue are very professional and helpful in the planning process. They are passionate about what they do and have reasonable prices to offer! Thank you for the kind review! We love what we do and I'm glad it shows through for you to see! We absolutely LOVED the Orrmont Estate and have received so many compliments on the beauty of the venue. This was one of the venues that held the most guests and everything is in one place. Tim and Janelle were great to work with and made sure everything was taken care of! This venue is beautiful! The venue owners are so professional and helpful. They made my day easy and gave great recommendations to make it of smoother. I've recommended them to all of my engaged friends. Make time to go to as many open houses as possible to aide in your planning process. Before you sign a contract make sure you know the rules of the facility and the capabilities of the facility. The rules and other information are provided to you and are on line to review. Our wedding went just as planned with no problems and we got along with the owners great because we knew what was expexcted of us and what we could expect from them. 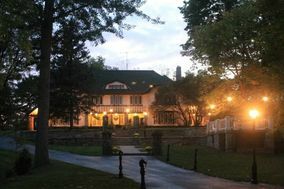 We held our wedding at a location on the property that had never been used before and the owners were very helpful. There are several locations on the property to choose from on the property to hold your ceremony. The owners made themselves available before and during the wedding as well as during the reception. Keep in mind that this is their home and some of the rules are meant towards that of their family. The owners are continually updating or adding to the facility to make it better. We picked this facilty because we loved the outdoor wedding areas and on cite reception area. We had the maximum guests at the reception and had plenty of space to dine and dance. All our vendors were able to make deliveries or set up with no problems and worked well with the owners. I found that the bad reviews are mostly due to customers not knowing the rules or expecting the rules to be lax. This is why I stressed ealier to know the rules and things go much better on both sides. I would not hesitate to book this venue again and would highly recommend it to others. The Orrmont Estate is a gorgeous venue for a wedding. The whole scenery for our wedding day was breathtaking thanks to this beautiful property. We received many compliments from our guests on how perfect the venue was. Our photographer who wasn't familiar with the place ahead of time even raved about how many amazing backdrops there were. Everything was perfect!! We couldn't of picked a better place for our day. Janelle and Tim Baker were great to work with and helped make our special day even more memorable. We HIGHLY recommend The Orrmont Estate. They Definitely have a way they are used to doing things but we loved that about them. They knew exactly what would work and what wouldn't work. Anytime we needed them they were there and ready to help. Loved the Orrmont! I found Orrmont Estate from a Google search and couldn't believe all the times I had driven by it without noticing it! If you peak down the long lane and through the large black gate you'll see trees on either side of the drive and a beautiful old house. This is where Tim & Janelle Baker call home with their 4 young sons and allow it to be used as a venue for weddings. We toured it in December and even in the dead of winter it was a beautiful location!!! We booked it a week or so later. :) Tim & Janelle were very quick on answering any and all questions we had and were easy to work with. They were very clear with the rules and things expected of us but were also clear with what they were providing. They have an open house in May for all of those that have booked weddings. They have the tent set up for you to see and you are welcome to bring whoever you wish for the 3 hours. This helps you get a better idea as to what you would like to do and how you would like to lay your tables and chairs out/decorate. They also have a printable grid of the reception tent layout which is a phenomenal tool! The concrete under the reception tent has evenly spaced squares that are all 10ftx10ft so you can easily plan your spacing. We planned ours in an evening for a wedding of 250 people and everyone had ample room. Each square fits either a round or rectangular table, and up to 9 chairs, comfortably. They put all the chairs and tables out for both the ceremony and reception and also clean them up. A fun feature recently added to their venue is a photo booth which we chose to do in lieu of table favors. Everyone LOVED it and each guest was able to take a photo strip with them while the other strip was taped to a scrapbook right there and the guests could write a message to us! It was a great price and well worth the money. I've run out of space but it was wonderful and we have nothing but good to say!!! The Orrmont is a great place if you want the option to choose your caterer and bring your own liquor and beer. The down-side to it is you only have 3 hours for setup on friday night and then 8 house for the wedding/reception on saturday. You can buy extra hours for $100 per additional hour. But everything else is great there. I would most definitely recommend The Orrmont Estate. The scenery is breath-taking and there are a plethora of outside areas to get married at on the estate. The owners were wonderful to work with. The only "complaint" that I have is this: I got married on a Sunday, which meant that I had to set up on that day. I did not know until the weekend of that we could not set up anything until 11:00. Still, not a major problem or a real complaint. Also, make sure you go to the open houses that they offer and think of important questions to ask (like what time can I set up?) BEFORE you go to the open house.